UC which stands for Unified Communication, is a communication solution that unifies all your communications (data, voice & data) into one platform. Designed to manage your telephone services in one entity instead of managing separately. For example, You can control all your telephony (inc. Fixed & Mobile Phone, VoIP), data and Video (Inc. email, presence & social media) through a laptop, desktop or mobile device. The ease of this flexibility to respond and retrieve information at any place and at any condition is described as Unified Communications. UC is not a single product, but a set of products that provides a consistent unified user-interface and user can access across multiple devices and media types. The main feature of UC is that any data sent through one medium can be retrieved from another medium. 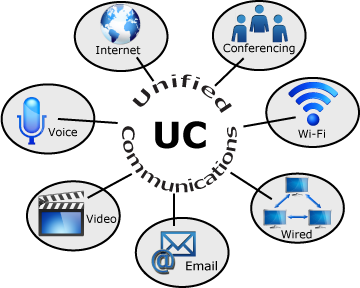 The idea behind UC is unification. This is the process which combines telephony and data on same network. It gives users the ability to combine and use voice, data and even video information in their routine applications, saving and forwarding whole instant message streams, faxes, emails, voice phone calls or videoconferencing sessions as chunks of data. UC can encrypt data that is being sent across network which cannot be intercepted which is particularly useful for sensitive information. It differs from standard telecom systems as it uses server based technologies and digital IP networks. Also this sends voice over network as digital packets unlike analog telephone systems. UC supports single number reach facility, which means a unique access point is used for all the communication preferences. For example, if a person can be contacted in five different modes such as telephone, Skype, Gmail, Viber and WhatsApp, five different identities has to be recognized. With UC, the person will have only one identity to contact him in all the five different modes. The requirements of UC basically lies in three main areas. Initial requirement would be a Device that will act as a UC Server. Second, is a stable Network Connection and finally, the Software to run the platform. 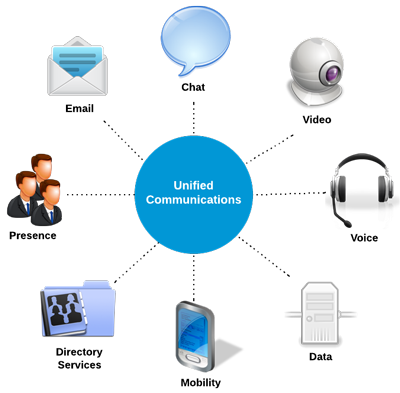 Unified Communications bring cost savings to a business as well as an individual due to a common interface being used. This ensures that the presence of the user from any of his communication mode remains constant in terms of his availability enabling to communicate and retrieve his response instantly. It optimizes business processes and enhances human communications by reducing latency, managing flows, and eliminating device and media dependencies. The ability to easily communicate seamlessly via a wide range of integrated components would arguably better facilitate all types of communication. There is nothing particular as a disadvantage to the intervention of this system. However, this will entail individuals to get addicted and rely more on this system, thus losing the physical presence and relationships. The development of UC is being unfolded gradually in the modern era and the pace of readiness of people to encompass this technology still remains a question. It appears that ultimately the solution must be software based and rely less on hardware proprietary features as communication systems become more diverse, the hardware must support those software technical elements and upgrades. UC is useful for everyday communications. Obviously businesses of all size need UC and can take advantage from it. It is important in an emergency communication system. In an emergency, the ability to communicate life-saving and damage-mitigating notifications and instructions are very important. Therefore, UC would bear great benefit for emergency oriented communications such as The Police Forces, Fire Departments, Banks, etc.